Enjoy the excellent hot basil flavor, so common in Thailand and perfectly captured in this sauce. We have personally visited the factory of this manufacturer in Thailand, located in a state-of-the art estate. The sauce is made with fresh ingredients, using all of the finest machinery and hygienic process. 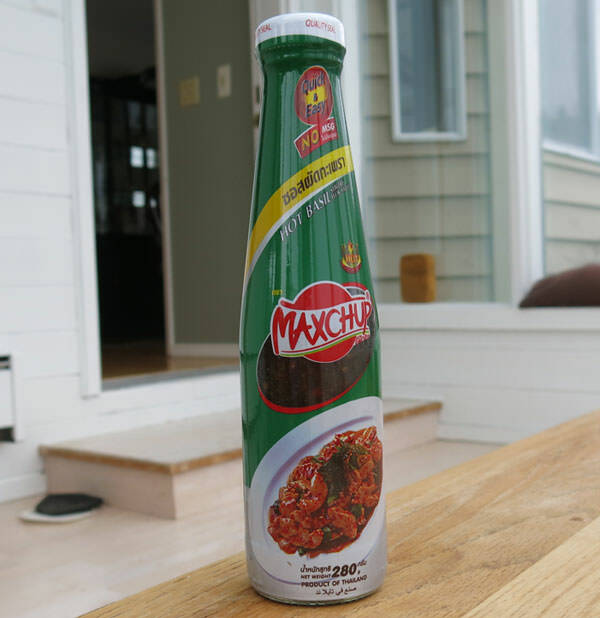 Maxchup is sold in modern supermarkets throughout Thailand now, and it's a popular flavor we think you'll enjoy. It can be used as a stir-fry sauce but also a marinade for summer barbeques. Hot basil sauce is also a quick shortcut to make Pad Kee Mao (Thai drunkard's noodles). Any Thai dish with the name Kee Mao can use this sauce, and if you add more the recipe gets more spicy. It's versatile, if you use just a little bit the flavor is good and the spice is low, add more and it will become so spicy you'll start to sweat. Comment from customer Randy Z in Michigan: Just had to write again to praise the Maxchup line of sauces. I'm quite a good cook, and rarely would endorse something as complete, right out of the bottle, but these sauces are amazing. Maybe it's because they're simply made from the same stuff you'e cook with, not a bunch of corn syrup -- I don't know how they get such fresh flavors to survive the bottling process, but they do. If I'm in a hurry or home late from work, I shake a little of the hot basil Maxchup on some stir-fried chicken and onions, it's really good. Today I seared some tofu cubes and shrimp, tossed in some broccoli, and a couple shakes of the black-pepper sauce that you had on special last week (I am so happy I ordered five bottles!). I can't believe it came from a bottle and I can't believe I'm saying this - it's as good as anything I make from scratch. It's phenomenal with shrimp. I love it!